"Once there lived a king who had power over all nations and people. His courts were of richest-splendor; his tables were heavy with finest food. 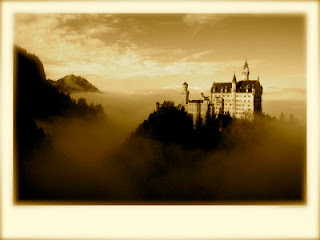 Music and laughter and gaiety floated from his castle. Peasants - in their valley of violence and hunger - stopped and looked at the castle for a long while, wishing they might know the king. But none were able to reach it. In the cold of winter, the king's tailor entered the royal chambers with the latest additions to the king's wardrobe. He had selected the finest materials and woven them into the most beautiful garments that eyes had ever seen. But the king was not pleased. He ordered his tailor out, vowing to make his own clothes. The door to the throne room was shut and locked. Weeks passed. The royal court waited with anticipation to see what the king would make for himself. They knew they were bound to be blinded by the glory of it. Finally the awaited day arrived. The door opened and the king appeared. Everyone, especially the tailor, gasped in surprise. His Majesty was dressed in the simplest, cheapest, most unkingly garments imaginable. He had the choice of the world's finest materials, but he had chosen to wear the clothes of a begger. And He did go into the valley... our valley. Imagine the shock in Heaven when the plan became clear: Emmanual - God is to be with us. It is The Miracle of Christmas... Jesus left perfection to be one of us. Leave comfort, power and position behind to identify with people in trouble? Give everything away to identify with the poor? Become homeless to reach homeless people? Accept punishment for people who didn't deserve your help, didn't know and didn't care? And why did Jesus do this? He did it for the Glory of God... and to our eternal benefit. I can't comprehend it all - what Jesus gave up, and why He did it. But I do know this: Your sin and mine created the problem... separated us from God. And the distance was so great, the problem so severe, the burden on us so impossible that only the initiative of the God of the Universe was enough to bridge the gap and offer us hope. And like the King in the parable above, He became like us - to our eternal benefit. Amazing, isn't it? Yes, it is. If you don't know Him, seek Him - the One who gave up EVERYTHING for you. That's the real meaning of Christmas. May "the eyes of [all of] our hearts" be enlightened (Ephesians 1:18) to see Him as He is - and the incredible love He has shown towards His chosen ones - this Christmas Eve... and throughout the year. Amen.I always wonder why me? Grace.. It is THE question, isn't it? Thanks!